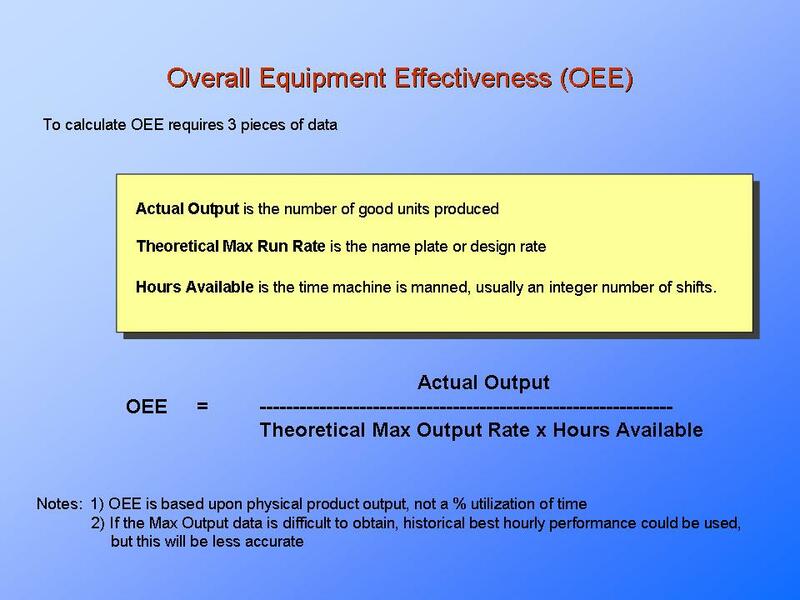 OEE, Overall Equipment Effectiveness is a simple, yet very powerful method of visibly demonstrating what percent of time, an item of production equipment is engaged in useful production. In its most basic form OEE is a measure of equipment and machine utilization, however if applied correctly OEE becomes a driver of product quality improvement, forces process balancing, promotes employee development, improves the integration of manufacturing with support functions and demands management understanding of the capabilities of a facility. Longer term OEE can significantly influence organizational strategy delivering competitive advantage and continually improving the customer experience and relationship. Introduction to Overall Equipment Effectiveness. Process equipment may be continually in use, however, may not be actually productive. For example, for all manufacturing and process equipment, there are requirements to set-up the equipment or to re-configure the equipment due to changing production requirements, process equipment needs to be cleaned, will require routine (planned and unplanned) preventative maintenance and calibration etc.. While all these are essential aspects of routine production activity, none result in the item of process equipment, actually being engaged in useful production. In addition, you also need to consider the output from an item of equipment. Not all output will meet the customer quality requirements, there may be a certain percent of output which results in scrap, or requires repair or rework. If say 1% of product through a process is scrapped or reworked, then that is another 1% less productive use of an item of equipment. Only when process equipment, is actually producing good product which is fully conforming to customer requirements, is it considered to be productive. By calculating and reporting an OEE measure for an item of equipment, which shows what % of time, the item is usefully operating, we can see the true percent of productive time. Once we know this percentage, this then becomes a target to be continually improved. We can continually improve the OEE %, by reducing set-up times, improving changeover times, eliminating scrap and rework, optimizing maintenance requirements, etc.. Overall Equipment Effectiveness. Set-up Reduction. Cycle Time Analysis. Flow Layput. … Etc. 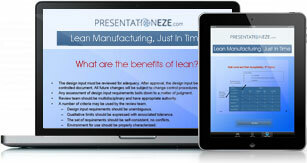 … Information and training presentation on Lean and JIT Processes. Details. The “Hours Available”, which relates to the time that machine is manned, usually an integer number of shifts. Develop your personal knowledge of “Lean” and “JIT”. OEE can be a very powerful force for change within an organization. The OEE % is relatively simple to obtain and by implementing a program to improve the OEE %, will result in quality, reliability, productivity improvements. … requires a focus on equipment on-time, equipment throughput and output quality. Equipment throughput is influenced by the equipment design, product mix, scheduled and unscheduled downtime, overall customer demand levels, fluctuations in demand, run-rate versus run-life decisions, …. Output quality demands that only acceptable product is produced by an item of equipment. Output which is subsequently subject to repairs, rework, scrap is of no benefit. Having to re-process material back though an item of equipment, which may itself have a % reject rate significantly reduce equipment usefulness. The major contributors to low level OEE rates. Equipment on-time can be significantly impacted by planned downtime i.e. maintenance and un-planned downtime i.e. breakdowns. Breakdowns need to be seen as a failure of the planned maintenance processes. The planned maintenance processes must be examined to see how maintenance can be performed while minimizing equipment down time. Equipment throughput can be negatively impacted by a range of factors. Each factor needs to be identified and examined to identify potential improvements. Are design changes possible with a view to increasing throughput? How is the product mix determined? Is equipment throughput (and uptime) across the facility considered in product mix planning? Can customer demand be influenced to optimize operating efficiency, e.g. differential pricing to reduce peak demand levels and increase off peak demand with a view to creating more balanced overall demand levels. Equipment quality needs to be seen as a given in terms of “right first time processes”. Any deviation of high quality outputs must be addressed with an objective of achieving as close as possible to 100% quality output. OEE as a strategic approach to process improvement? OEE is a relatively simple concept, easy to understand and if actively implemented will drive in-process and customer reject rates down, will drive down process variability, will improve engineering understanding of process equipment capability and operation, will increase line employee involvement, etc. etc.. So rather than organizations seeking to implement say a six sigma process, with all the required black, green belts, etc., would it not be a lot simpler and possibly as productive to implement an OEE improvement program? OEE is a basic measurement of the performance and availability of process equipment. If actively pursued as a strategic objective within an organization, it can very effectively improve overall organizational performance. For example in order to improve the OEE %, output in the form of scrap, repair and rework will need to be reduced or eliminated. This will require a concentrated effort to reduce process variability, possibly requiring the process to progress sigma step performance improvements in variability reduction. Effectively this means implementing a six sigma process without actually formally going down the six sigma route. However, it will require knowledge of sigma methods within the organization. Therefore, the OEE strategic improvement objective, will demand training and competence development across the organization in the six sigma methodologies. Another example is the requirement to reduce process set-up time in order to improve the OEE percent. Again, set-up reduction if implemented across an organization, is effectively moving the business towards a “lean”, “just in time” approach to process control. One of the key concepts in the implementation of “lean” and “just in time” is the continuous requirement to reduce equipment and process set-up times. Therefore, by having a strategic requirement to reduce the OEE %, the senior management of an organization are asking line managers, engineers, etc. to implement a “lean” or “just in time” philosophy, with all the consequent benefits of improved output quality, improved customer response times, reduced operating costs, etc.. Looking at one final example. In order to improve the Overall Equipment Effectiveness measure, there will be a need for line staff and equipment operators to have an in-depth understanding of the process equipment they are responsible for operating and maintaining. Only by truly understanding an item of process equipment, can say a maintenance technician hope to optimize the operating time and ensure unplanned breakdowns are minimized or eliminated. Similarly, if an organization plans to progress towards being a “lean manufacturing”, “just in time” organization, staff must be fully competent in their respective work areas. Their level of responsibility, their freedom to identify and implement process improvements must be developed in order to ensure the process operates with the minimum number of unplanned process breakdowns. Effectively, the objectives for OEE % improvement and those for implementing “lean” and “just in time” are aligned. Clearly, in all instances, line staff, managers, engineers, etc. will all need to be competent and may need to receive training in the techniques for OEE, Lean and JIT. In summary, can OEE act as a strategic approach for improvement within an organization? While OEE is basically a KPI (key performance indicator), it can significantly contribute to overall organization improvement. However, just like improvement programs such as “six sigma”, “lean” and “just in time”, it will require on-going management commitment and support, combined with a staff who are competent and confident in the application and use of the various OEE, “sigma”, “lean” and “just in time” concepts and methodologies.